The following is an abridged excerpt from The Art of Bliss. If one or more of the nine life areas is “missing” or lies outside of the boundary of your floor plan, there are a number of things you can do to include these energies in your home and life, ranging from very involved to very simple. We’ll start with the more involved and go toward the ones that anyone can do with any space, no matter what. Find one or more that works for your unique space, and resonates as something that will be powerful for you. Option 1: Choose an outdoor cure. If you have freedom with the area, and you have the funds or skill, you might like to fill in the “missing” floor plan area by adding a room or a deck. Alternatively, you might fill in with a delineated garden or by placing a substantial yard addition (such as a gazebo, lamp post, fountain, statue, stone, or tree) at the farthest point of the “missing” corner. Option 2: Bury a crystal. But if all of this is a little too involved, or if none of the above suggestions are possible for whatever reason, you might consider burying a white quartz crystal point (or two if it’s the romance area – you can also vary crystal type according to the energy you want to draw in), point-side up and very slightly angling toward the center of the floor plan, at the corner of the formerly missing area. Choose a crystal that is at least four inches long and feels somewhat substantial. Be sure to cleanse it first (here’s a post about ways to do so, if you don’t already have a method you like). Then, before burying it, hold it in both hands and charge it with the intention to symbolically complete the space and bring in the energies of the formerly missing area. You might send intentions and positive feelings related to this life area at this time as well. Option 3: Paint a dot. Still, sometimes you can’t do the crystal either because the corner of the missing area happens to fall on your driveway or another paved area. If this is the case, and it feels right to you, you might like to complete the space by painting a dot between the size of a quarter and a silver dollar on the pavement. A round, bright red dot would be a classic choice, but if another color or shape feels right to you, go with that. Option 4: Create the illusion of space. And then there are those of you who live in an apartment, or the outdoor space is not under your control for another reason. In these cases, you might like to bring in the energies associated with the missing area by creating the illusion of space. To do this, hang a mirror or art with depth (such as a house with a long stretch of field behind it, or an ocean vista) on the wall bordering the missing area. Make sure the artwork gives you positive feelings related to the life area that you’re intending to include. Option 5: Emphasize the area within each room. Finally, you can also bring in the “missing” energies by emphasizing the area in each room that corresponds with the area. In other words, your entire home isn’t the only place with a prosperity area: your living room, bathroom, bedroom, etc., each have one as well. To discover the floor plan of a room, determine the main door to the room. If there is more than one door and you’re not sure which is the “main” door, you can discover this by determining which one is closer to the front door or which one borders on one of the main tributaries of the home. Once you’ve determined the main door to the room, simply consider this the front door, draw a tick-tack-toe board over the room, (just as you did in this post), and determine which area is which. To illustrate how you might then utilize this information, let’s imagine the prosperity area is the area that is “missing” from your home’s floor plan. To balance this condition, you might obtain a silver dollar for each room in your home, cleanse the silver dollars in salt water, empower them in the sun and in the light of the full moon, and place one in the prosperity area of each room, while envisioning and affirming wealth and prosperity flowing to you in abundance. All very interesting. I am still clearing the clutter but will implemnt these principles as soon as I can. 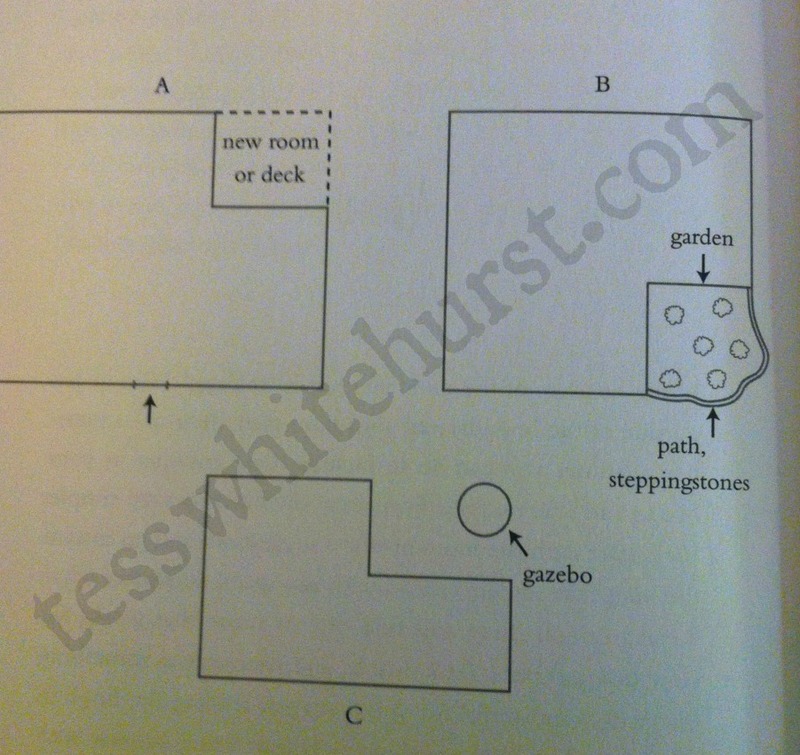 Hi Tess, I'm working on my room and my entrance is on a diagonal, that ends up making a V. Will that throw off the mapping? As well as do I count my closet as part of the map since it would be on the other side of that V in the entrance? I am missing a good chunk of the “Gratitude and Prosperity” section of my apartment. I am on the first floor, and kind of secluded, so I might be able to bury or otherwise stick something in the ground. However, I do have a large window on the wall running straight through this section. Does that window count as an “illusion of space”? Hi there! Well, it certainly helps. You could hang a prismatic crystal in the window to catch the light and bring in extra energy.